Different from other Sexually Transmitted Diseases (STD) such as herpes, Molluscum Contagiosum may disappear without treatment on men and women after 12 to 24 months of waiting. During this period, you still are contagious. 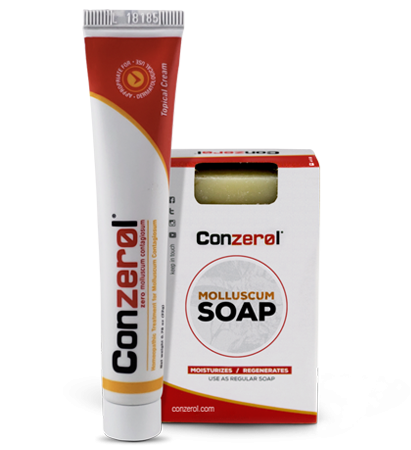 Conzerol® is formulated to bring molluscum contagiosum relief in a painlessly, and safe manner. With Conzerol® you can be you again. Is it safe to use Conzerol during pregnancy? Yes, but do not use it internally. Can Conzerol® be used an immune deficiency or HIV? Yes. Adults that are HIV positive can also use Conzerol for molluscum without any side effects. Conzerol’s® formula inhibits the Molluscum Contagiosum virus, as well as stimulates the immune response of the human body. Molluscum Contagiosum (MCV). A common, contagious human-to-human transmitted viral skin infection infecting millions of suffers each year. MCV is a DNA virus of the Poxveridae family. It has a high incidence in children, sexually active adults, and those with weak immune response. It can also be contracted from contaminated, solid surfaces (formites). We provide a 60-day money back guarantee for purchases of Conzerol® cream; this refund does not include handling & shipping, Soaps, H202 Gel, and/or Probiotics.